The Eastern coyote and the Western coyote are often classified separately. There are 19 subspecies of coyote. Native to, and common throughout, parts of north America. 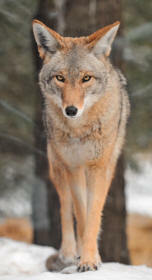 Also known as the American jackal or the prairie wolf.